the deep sides of oval section thinly cast, with a narrow central band of scroll ornament in thread relief encircling the waist above a wider rounded skirt, the very slightly rounded base raised on three curving blade-shaped legs of triangular section, each with a central ridge left from the casting mould on the exterior, the slender gutter-shaped spout with a pair of angular posts capped with domed finials projecting from the rim at the conjunction of the spout and the mouth which rises to a sharp flaring point at the back, with a simple strap handle of slightly waisted form set vertically on one side, bridging a gap in the decorative band, the thin dark olive-green surface patina, with wide areas of paler green and tan-colored shallow encrustation. 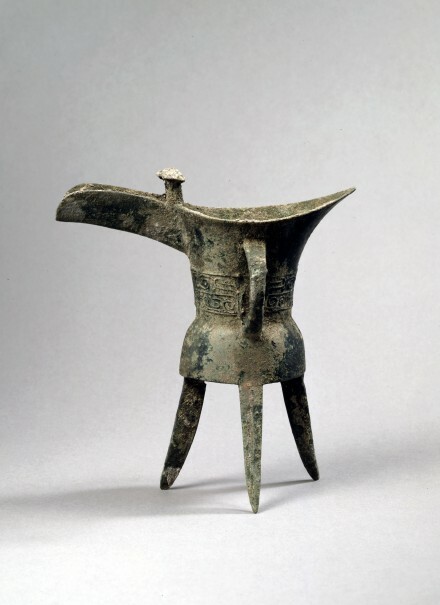 Compare the jue of similar design and form, from the collection of the National Palace Museum, Taipei, illustrated in Catalogue of the Special Exhibition of Shang and Chou Dynasty Bronze Wine Vessels, Taipei, 1989, p. 63, pl.1. Compare also the jue of this early type with a more rudimentary thread design, excavated in 1951 from Huixian, Henan province, now in the Chinese History Museum, Beijing, illustrated in Zhongguo Qingtongqi Quanji (Compendium of Chinese Bronzes), Vol. 1, Xia/Shang, section 1, Beijing, 1996, p. 61, no. 62 with description on p. 20.